RENDER WHILE YOU WORK WITHOUT BUYING THE FARM. Unnecessary features have been eliminated with renderPRO 2, the multi-threaded, dedicated rendering/simulation powerhouse compatible with any PC workstation and featuring up to two 18-core Intel® Xeon® processors and 256GB of system memory. Dedicated desktop rendering from a tiny sidekick! The renderPRO 2 is a complete computer powered by dual Intel XEON processors and plenty of memory. We’ve stripped out all the unnecessary features and have boiled it down to what matters most: CPU core count. The renderPRO 2 was designed for 24/7 maximum workload operation, and to that end we’ve engineered a cooling setup that keeps it cool for reliable operation, yet quiet enough to sit on your desk. 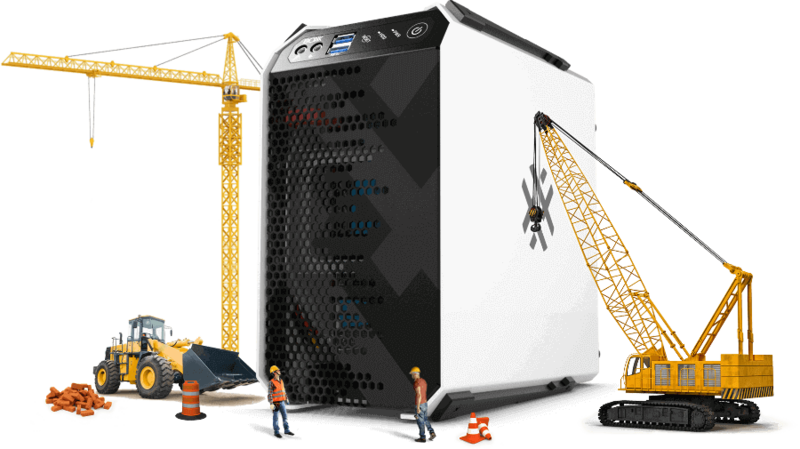 The all-aluminum chassis was designed to sit directly on an APEXX 4 and also allows it to be stacked several units high for a powerhouse desk side render farm solution. Note: renderPRO is compatible with any PC workstation. You do not need a BOXX workstation in order to use renderPRO. At BOXX we understand your workflow, the programs you use, and we design solutions from the ground up to run those programs in a way that deliver real results that keep you creating and not waiting. The renderPRO portable render farm is the only desk side personal rendering system and simulation solution designed for offloading computationally intensive tasks. Keep your workstation free to keep creating without bogging down your CPU. When combined with an overclocked workstation, your workflow will fly with maximum performance regardless of whether you’re bottlenecked by frequency or the number of cores. renderPRO 2 requires only power and a network connection. That’s it. Once your renderPRO 2 is connected to your network, use the included BOXXView software to discover and take control. From there, you can remotely install your software and get to work. It really is that easy. Watch our comprehensive setup video and see for yourself.